Celeriac or celery root is a knobby member of the celery family. Quite frankly, it’s a pretty ugly looking veggie, but don’t let that fool you. As it’s name implies, it has a wonderful almost pungent celery flavor. It is low in carbs, and is often used raw in winter salads, sliced very thin and julienned, added sparingly to flavor to soups and stews and to liven up and lighten up mashed potatoes. 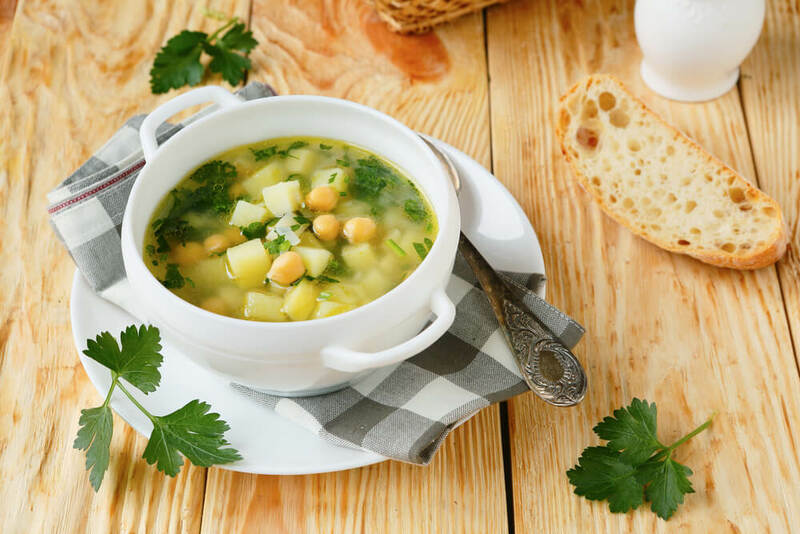 In this quick and easy vegan chickpea soup, it is the star. When cooked slowly, celeriac becomes sweet, and is a perfect partner for nutty chickpeas. Lemon juice adds a little zing. Stir in the bright taste of gremolata before you eat and you’re all set.